Melting in northern Greenland lasted up to 18 days longer than previous maximum values. The melting index (i.e. 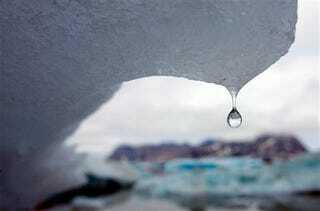 the number of melting days times the area subject to melting) was three times greater than the 1979–2007 average. The snowmelt and temperature anomalies occurred near Ellesmere Island, where several ice shelf break-ups were observed this summer. The region where the record melting days were recorded includes the Petermann glacier, which lost 29 square kilometers in July . . . [Earth scientist Marco] Tedesco explains to The Daily Galaxy that he doesn’t know for certain if this rapid snowmelt suggests that global warming might be happening faster than predicted? “At this stage of the analysis it is not possible to draw any conclusion in this regard,” he noted. Professor Tedesco and his colleagues are currently analyzing possible causes for the high snowmelt in northern Greenland. High surface temperatures are, so far, the most evident factor. However other factors, such as solar radiation, could play a role, as well, he noted.